I love a good playdate. Getting out of the confines of our teeny home for a change of scenery benefits my kids and me. My kids get to have peer interaction and I get adult conversation. It's a win-win! Our playdates are usually pretty lame, though. More often than not it's a trip to the playground two blocks from our house. It's on my "kiddo bucket list" to take them to Scheel's and ride the ferris wheel. It was always my favorite ride at the county fair and my 8-year-old has never been on one. I can't wait to share that with her! In an effort to redeem myself from past pathetic playdates, I am on the lookout for super fun activities to do with my kids this summer. That's why I'm stoked about Hyundai's Epic Playdate Weekend. April 27, from 9 am-5 pm, Hyundai is hosting an epic playdate in Santa Barbara, California with some pretty high-profile bloggers like Dooce, Oh Happy Day, and Say Yes to Hoboken. They're camping on the beach and hosting workshops for kids. How cool would it be to chill with these web-celebs and their families? Ice cream sundae bar? Don't mind if I do. Hula-hooping workshop? I'll bring the saddle shoes! Paint fight? Not gonna lie. Dooce would kick my trash. The thing is, not just anyone can go to this shindig. It's invite-only. Lucky for you, Hyundai is giving away a trip for four to this exclusive playdate. You MUST have a Pinterest account to enter. 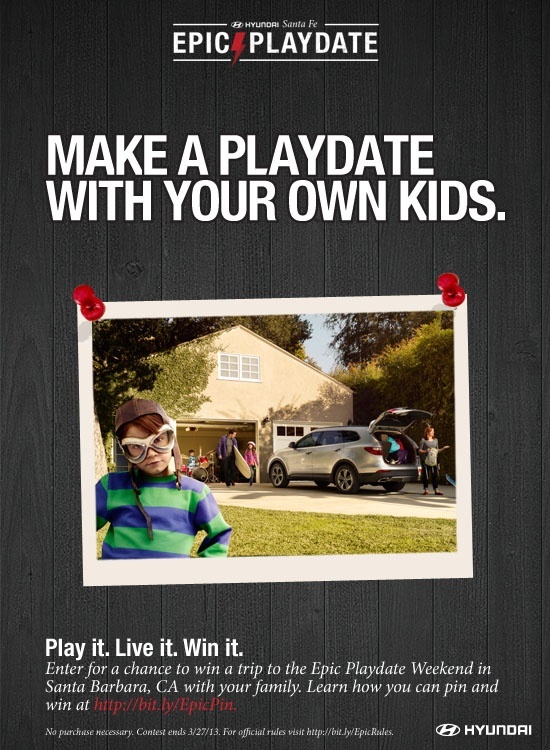 Visit the Hyundai Epic Playdate Weekend sweepstakes page, follow the instructions, and fill out the form. When the form asks, "How did you hear about us? ", you MUST choose Clever Girls Collective. So what's your idea of an EPIC playdate? Chillin' on the beach with some awesome bloggers? Or would you be content to ride on a ferris wheel like me? Make sure you share in the comments!